A dish that makes a regular appearance on my Thanksgiving table, thisRoasted Butternut Squash Casserole is a big hit every time! Roasted butternut squash is one of my favourite things. It’s like candy … candy that’s good for you! I love to roast up a bunch in the Fall, when butternuts are plentiful and reasonably priced. I’ll top them with a sweet, crunchy pecan topping, bake them up in the jars and then freeze them for winter eating. When I’m needing a side dish, I just pop one or two out of the freezer, and then throw them in the oven to reheat along with whatever it is I’m cooking. This squash side dish is also perfect for Thanksgiving and Christmas Dinners. It’s a crowd pleaser. Even the kids will love this! Bake it up in a single casserole dish for something a little different from the usual sweet potato casserole. Butternut squash is so sweet that you don’t even need to add any sugar to the squash part itself. I just put in a bit of maple syrup, for flavour. 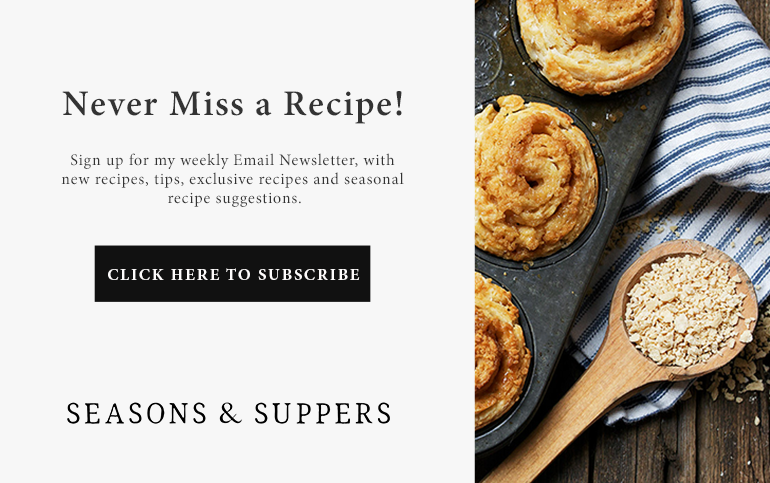 The crunchy, sweet topping with pecans just takes it up a notch for special occasions or makes every day meals feel special. If you’re feeling extra naughty, double the topping and pile it on, for some extra crunchy goodness. I make this ahead by roasting the squash off ahead and keeping it in the fridge until the big day. Then I just have to mix it up, add the topping and pop in the oven. 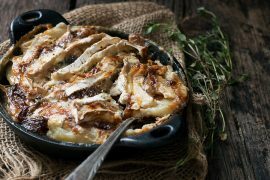 This is a perfect dish for holiday entertaining (Thanksgiving and Christmas), but also easy enough for every day. 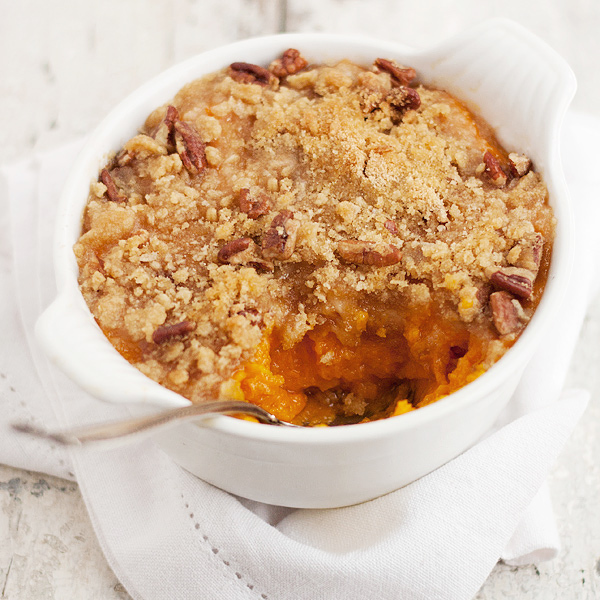 The sweet squash and crunchy topping means even kids will like this one! Freezes well. Cut the squash in half lengthwise and remove the seeds. Place the squash cut side down on a baking sheet and cook in the preheated oven until the squash is soft and can be easily pulled away with a fork, about 50 - 60 minutes. While the squash is roasting, prepare the crunchy topping by combining 3 Tbsp. of melted butter in a bowl with the brown sugar and the flour. Mix with a fork just until it forms a crumbly mixture. Stir in the pecans. Set this aside for now. When the squash is cooked, remove from oven and let cool slightly. With a large spoon, scoop out the squash into a mixing bowl or the bowl of a food processor/stand mixer, discarding the skin. 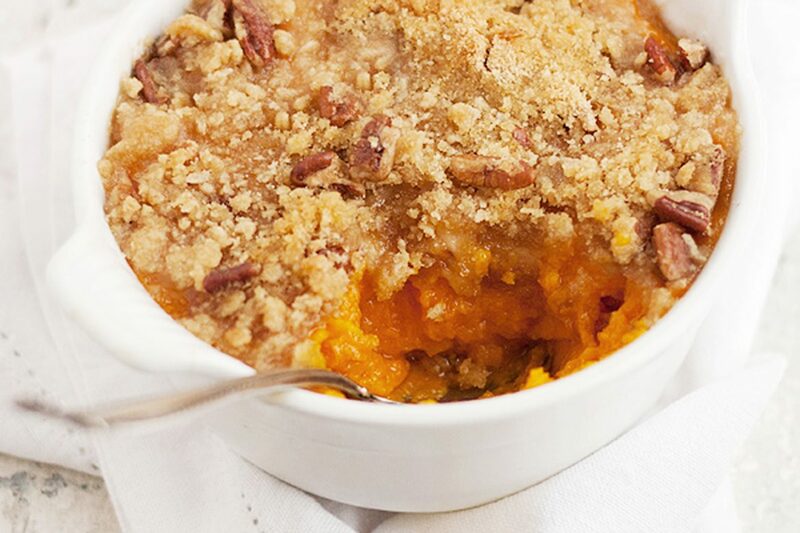 (You should have approximately 7 cups of cooked butternut squash). 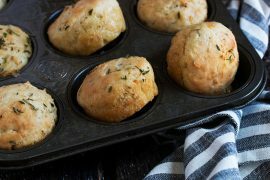 Lower the oven temperature to 350° and grease an 11 x 7-inch or 8 x 8-inch baking dish (or individual ramekins or jars). Beat, process or stir the squash until smooth, trying to remove as many lumps as possible. Add the eggs, half and half cream, maple syrup (or vanilla), salt , and the remaining 2 Tbsp. of melted butter. Process or stir this until it's well blended. Spoon the mixture into the prepared baking dish (or dishes). Sprinkle the brown sugar/pecan topping mixture over the squash. Bake in preheated 350° oven until squash is bubbling and the topping is lightly brown, about 35 - 40 minutes. 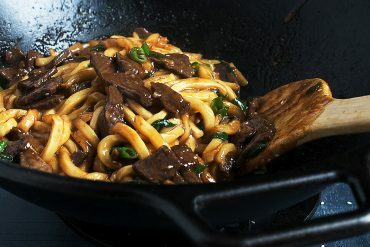 Cooking time may vary, depending on the dish size/depth you are cooking it in. 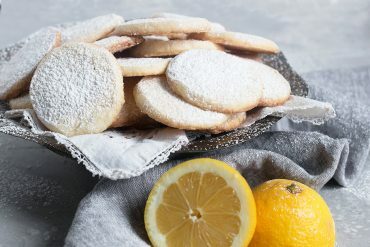 If you freeze these, you may want to place a piece of foil loosely over the top at some point during re-heating, to avoid the topping becoming too browned. 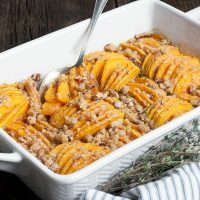 This Basketweave Butternut Squash Casserole is simple to make, but will make a big statement on your holiday table! Can be made ahead and re-heated, too. 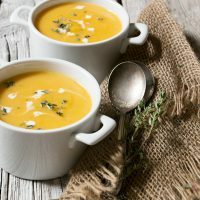 My Best Roasted Butternut Squash Soup, is a classic butternut squash soup that is, in my opinion ... simply perfect! 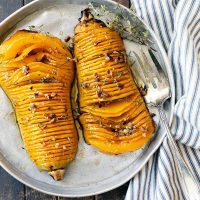 Hasselback Butternut Squash, roasted with maple syrup and butter, flavoured with thyme and topped with chopped pecans. Hello! 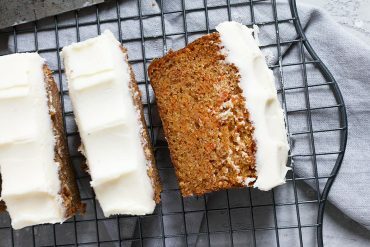 I’m making this ahead of time … where in the process do I freeze it? Before or after baking? What’s the best way to re-heat once I get there? Thanks from a non-cooker! Hi Carly, you can freeze either before or after baking. Re-heat in 350 oven until warmed through. 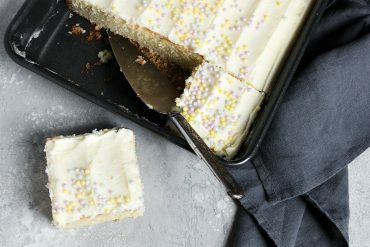 If you bake before freezing you may need to cover loosely with foil part way through heating if topping starts to get too browned. Enjoy! 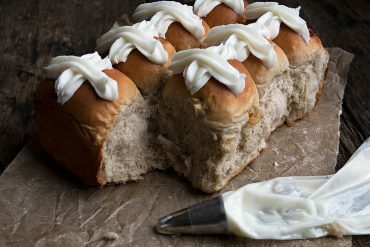 Can you bake this in the mason jars, or did you bake it and then transfer to the mason jars? Hi Anum, it’s been a while but I’m certain I baked these in the mason jars. Thanks for pointing my to SK’s potatoes. How pretty!! Must try them. 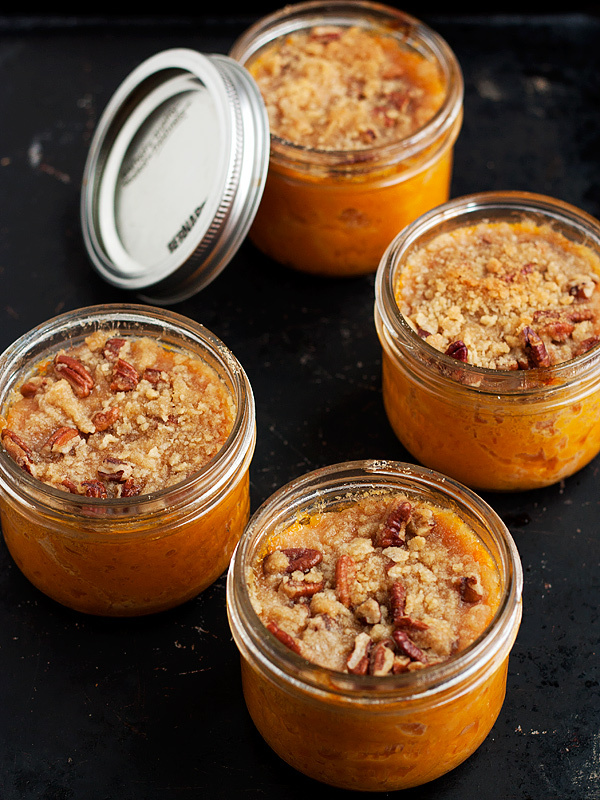 I love butternut squash and this is so fun to serve in individual jars! Thanks Chung-Ah. Butternut squash is one of my favourites and it makes a great casserole. The topping just makes it even better :) Hope you’re having a great Thanksgiving weekend. I love that pecan topping! And this butternut squash is genius! 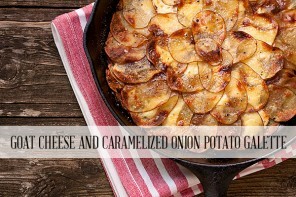 I’ve never really made it in casserole-style before!